It’s been a big year for the Center for Cartoon Studies. The nation’s only cartoon school, based in White River Junction, kicked off 2011 with the announcement of Vermont’s first, official cartoonist laureate, the prolific James Kochalka of Burlington. (Any cartoonists out there hoping to succeed him, keep your shirts on: It’s a three-year post.) At the end of August, CCS did battle with Tropical Storm Irene when the White River poured into the building that housed the school’s Charles Schulz Library. Students, staff and community members labored through the night to move its contents, and, yep, all the books were saved. Well, a new old building. CCS closed Monday on its purchase of the historic post office on South Main Street, which was constructed in 1934 as a WPA project. 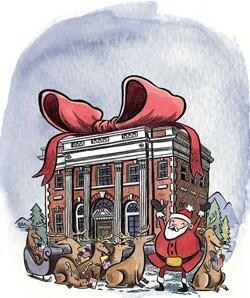 The colonial-revival-style brick structure (see illustration, by CCS alum Alexis Frederick-Frost) has also been a Vermont District Court and a private office building. It’s about to become the cartoon school’s HQ, housing classrooms, faculty space (absent in the current quarters) and the library. Existing tenants in the upper floor will remain, their rent helping to pay the mortage on CCS’ first fully owned building. She reveals that the seller of the building, real estate developer (and CCS board member) Bayle Drubel, gave CCS “a price point that is just unbelievable — a couple hundred thousand [dollars] below market value.” And so far, the school has received $93,000 in pledges to help pay for its new digs. After renovations, Ollie says, she and fellow founder James Sturm expect to greet new students there in fall 2012. In other news, former CCS fellow Max de Radiguès of Belgium was selected to go to the Festival International de la Bande Dessinée d’Angoulême in January. The cartoon fest — referred to simply as “Angoulême” by Americans — takes over the French town of about 40,000 once a year for three days. Imagine being funny in so many languages. De Radiguès documented his time at CCS in 2009 with a weekly cartoon called “Pendant ce temps à White River Junction” (“Meanwhile, in White...”). Written en français, it was published in France “a few weeks after he would essentially live it and put pen to paper,” says the CCS website. The Center for Cartoon Studies, which launched in 2005, offers one- and two-year certificates and an MFA in cartooning as well as summer workshops. Students and graduates of the school contribute to a biweekly comics page, Drawn and Paneled, in Seven Days.